This paper studies the changing distribution of social capital and its impact on class formation in England and Wales from a 'class structural' perspective. It compares data from the Social Mobility Inquiry (1972) and the British Household Panel Survey (1992 and 1998) to show a distinct change in the class profiling of membership in civic organisations, with traditionally working-class dominated associations losing their working-class character, and middle-class dominated associations becoming even more middle-class dominated. Similar changes are evident for class-differentiated patterns of friendship. Our study indicates the class polarization of social capital in England and Wales. In this paper we inter-relate two central debates to the understanding of contemporary social change, which have hitherto not been considered together. The first debate is predominantly found in American political science and sociology and concerns the changing nature of social capital. Although a contested concept, the term social capital refers, in essence, to the interconnections between 'trust, norms and networks' (Putnam, 1993: 167), and claims that a range of generally positive social outcomes, such as democratic political cultures and physical and mental health, can be related to it. The second debate, stronger in European sociology, concerns the changing nature of class formation and, in particular, the changing kinds of class solidarities that exist as a result of economic, social and cultural change in late modern societies. It is the contention of this paper that there is a significant theoretical and empirical pay- off to be had by inter-relating these debates to show how the changing stock and distribution of social capital is related to the remaking of class relationships and changing processes of class formation. Having firstly established the theoretical ground on which this encounter can take place, we turn to examine the class selectivity of friendship and the class profiles of voluntary association membership in England and Wales. Although the class exclusiveness of friendship has been regarded as an important dimension of social stratification in the work of Goldthorpe (1987), Wright (1997) as well as Blackburn & Prandy (1997), there have been no studies examining trends in the class selectivity in friendships over time. There is now increasing research on trends on membership of civic associations, notably in the American case (Putnam, 2000; Paxton, 1999), but these do not examine the class profile of memberships (for partial exceptions in the British case see Hall, 1999; Warde et al., 2001; Li et al., 2002). We show that if we consider class formation to encompass issues such as the class selectivity of friendship and the extent to which involvement in civic associations is class specific, then we can discern a clear process of class polarization in the distribution of social capital in England and Wales. This poses deeply worrying questions to those who are concerned with long-term changes in social structure and with the fostering of social inclusion, and who tend to see social capital as a positive good. Although oriented to rather different issues, there are overlapping concerns that make a study of the relationships of social capital to social mobility and class formation exciting. At the most general level, both relationships examine the conditions under which social collectivities form and cohere, and how processes of inter-personal trust and reciprocity are established and sustained. Writers on social capital focus on the conditions which allow otherwise diverse kinds of people to make common cause. The most celebrated version of this argument is the work of Putnam (1993; 1996; 2000) who adopts a neo-Tocquevillian approach to argue that voluntary associations provide arenas that allow forms of generalized trust to develop. Although Putnam (2000) acknowledges that social capital can be socially exclusive, he does not develop this point (see, also, Paxton, 1999). The main theorist who has emphasized the exclusionary power of social capital is Pierre Bourdieu (1986; 1987), who sees it as one of three main forms of capital that sustain class inequalities (for an interesting application, see Frank & Yasumoto, 1998). However, it is not clear how direct measures of social capital can be developed from Bourdieu's perspective that will allow a systematic analysis of its changes over time. There are a number of ways in which current accounts of social capital are liable to criticism from this class-based perspective. First, and most obviously, most studies pay insufficient attention to how changing class relations may impact on the distribution of social capital, and how social capital is thereby class segregated. Thus Putnam's (2000) influential account argues that the declining membership of most types of voluntary associations is an indication of a falling stock of social capital in the US and this should be a matter of concern. He argues that the main factors causing this decline are the role of television, different generational experiences, and to some extent the growing role of women in the labour market. However, he does not relate his findings to changing occupational structure or income inequalities. Paxton (1999), using multiple indicators of social capital over a 20-year period, shows that while there was some event-driven decline in trust in individuals, there was no general decline in trust in institutions nor in associations in the US. Hall's (1999) important overview of trends in social capital in the UK argues that there has been no general decline in social capital, especially as measured by associational memberships. He suggests, but does not demonstrate, that the growth of the middle class, who are known to be more likely to be involved in civic associations, may have offset other tendencies for social capital to decline. Hall's arguments however indicate a second problem with many accounts of social capital: that they rely on an implicitly middle-class definition. Hall relies on a 'trickle-down' approach to social capital in which it is assumed that the middle classes are most pre-disposed to foster social capital, but this social capital can then be put at the disposal of other social groups and is therefore socially neutral. However, it can be argued that socially specific social capital is in contest with others, so that increases in middle class social capital, for instance, may lead to the decline of working class social capital. Putnam recognises the possibility that this may happen, through his concept of exclusive, bonding, social capital, but does not empirically explore whether the social capital he examines in his account is of this nature. A third problem in existing research on social capital concerns the relationship between values and practices. Social capital is seen as a way of fusing people's social practices, notably their formal and informal social networks, with their values, especially their degree of trust. Paxton (1999) explicitly yokes these together in her definition of social capital. However, to assume that there are close relationships between them appears to take for granted what needs to be empirically established. In fact, in both the US and the UK, there has been a decline in people's generalized trust, but no obvious decline in formal and informal associational practices (Paxton, 1999; Hall, 1999). This raises the possibility that formal and informal associational activity may generate a decline in generalized trust. This would be perfectly compatible with an account that argued that when socially specific associations flourish, people may interpret the vitality of such associations as indicative of the lack of general trust and communication networks in society at large. For these reasons, we believe that it is analytically preferable to study formal and informal associational activities through a class formation perspective in which the precise nature and degree of connection between forms of social capital and social classes is seen as a matter for empirical inquiry. In general terms, class formation assumes that social conflict is entrenched, and explores how social cohesion takes place between those in roughly comparable social class locations (see, for instance, Wright, 1978; 1997; Goldthorpe, 1987). The inspiration for this work comes from Marx and Weber, as developed by Giddens (1971) and Goldthorpe (1987). Rather than it being assumed that classes would form as socially cohesive and politically active forces, as some Marxists have argued, they claim that it is necessary to establish the kinds of proximate conditions that can allow classes to form as cohesive entities. Goldthorpe (1982; 1987) identifies two kinds of class formation related to the development of a demographic identity and a socio-cultural identity. The former refers to 'aggregates of individuals, or families, identifiable in the extent to which they occupy similar locations in the social division of labour over time' (1987: 28-29); and the latter to the extent to which classes 'become identifiable through the shared and distinctive life styles of their members and their patterns of preferred association' (1982:172). Concerns with both friendship and membership of civic associations can be seen as linked to this socio-cultural identity and hence an integral part of class formation. In the 1980s there was a small amount of research that linked social mobility with friendship patterns (Heath, 1981; Goldthorpe, 1981/82; 1987; Mitchell & Critchley 1985). However, in recent years Goldthorpe has shifted his interests away from class formation and there has been little recent scrutiny of this issue (though see Savage et al., 1992). In particular, no studies have been conducted to investigate whether the relationship between social mobility, friendship construction and social involvement may vary historically. The class structural approach to social mobility associated with Goldthorpe and his associates (Erikson & Goldthorpe, 1992; Marshall et al., 1997) has not followed up its early interest in processes of class formation (see Savage, 2000) and a potential avenue of dialogue with social capital research has thereby remained unexplored. There are two particular ways that class specific patterns of friendship may impact on social capital. Firstly, there is clear evidence that friendship takes different, class specific forms, at least in Britain. The research of Adams & Allan (1999) and Goldthorpe (1987) emphasises that working class sociability is organised around associates who are met in particular kinds of settings, and who tend to know each other. Middle class sociability tends to be more segmented, with different friends not being known to each other, and is more oriented towards the valuing of intimacy (see, also, Jamieson, 1998). It can be suggested - perhaps counter- intuitively - that the kinds of social capital based on voluntary associations may be more germane to working class friendship patterns, in that they are more oriented to weak tie relationships. Although the middle class tends to be more involved in voluntary associations, the working class is as likely as the middle class to have spare time associates and good friends drawn from voluntary associations. This suggests that working class men are more likely to have friends drawn from those associations to which they belong. Whilst the middle class may be more likely to belong to voluntary associations, they do not rely on them very much as sources of friendship. This argument might then suggest that the decline of social capital suggested by Putnam may be linked to the changing class structure, and in particular, to the decline of the working class. Secondly, friendship, as a prototype of social relations, tends to be endogamous to social classes and conducive to class formation. Indeed it can be suggested as a particularly telling indication. Like romantic relationships, friendships are supposed to reflect individual choice. Silver, for instance, says: 'Friendship in modern culture is morally celebrated, in part, as a pure expression in the domain of personal relations of voluntary agency, as expressing individual agency and elective interpersonal affinities that in principle, if not in fact, are independent of ascriptive and categorical criteria' (cited in Pahl, 2000: 63). Similarly, Stewart et al. (1980: 33) remark that: 'Only friends are freely chosen and engage in non-instrumental social interaction on a basis of equality'. Therefore, if friendship choice is, in fact, highly socially skewed towards the homophilic principle that your friends are similar to yourself, then this suggests that the real class selectivity of friendship is the more powerful because it seems to be the product of free individual choice. Existing research shows that, 'in modern Britain segregation, or at all events highly differential association, on class lines is a dominant feature of the structure of sociability' (Goldthorpe, 1987:180). Our approach, therefore, is to recast the study of social capital within a class formation perspective and to examine how friendship choice and membership of civic organisations is related to the class of respondents as well as to their class mobility. By casting the analysis in these terms we can extend our understanding of the nature of contemporary class formation, consider how forms of social capital may play different types of roles for different classes, and avoid over-generalising about the stock of social capital in any particular case. We use two data sets: the Social Mobility Inquiry (SMI) of 1972 (the data source for Goldthorpe, 1987) and the British Household Panel Survey (BHPS) of 1992 and 1998. There have been no previous attempts to compare the findings of these two surveys, despite their prominence. The SMI is a study of social mobility in England and Wales for men aged 20 to 64 with a sample size of 10,309 respondents and is the largest survey carried out during the 1970s that contains information on, among other things, respondent's current and first-job class, origin class, friend's class and civic engagement. The BHPS began in 1990 as the premier British panel study, and contains around 5,000 households and 10,000 individuals each year. Although widely used for research on household formation and income inequality, its data on friendship patterns and civic involvement have rarely been examined hitherto (though see Warde et al., 2001; Li et al., 2002). The information on friendship is derived from Waves 2 and 8 (1992 and 1998). Data on civic involvement are available in Wave 2 but not in Wave 8. Whilst data on respondent's current and parental class positions are available, those on the class position at entry to the labour market (i.e., first-job class) have been obtained from work- histories at Wave 3 and the subsequent updates. To compare like with like, we restrict the analysis on the BHPS to respondents aged 20-64 at the time of interview and resident in England and Wales. Because the SMI only sampled men, we have divided the sample of the BHPS into men and women, so that the findings for men can be compared directly with those of the SMI. Variables on socio-cultural conditions are standardised. For both SMI and BHPS, we measure respondents' social mobility by examining their social class at three points in time: their current class, their class at the first job after leaving full-time education, and their parental class. The respondent's current class is based on his or her current job (or last main job if the information on current occupation is not available). Parental class refers to father's job at the respondent's age around 14. Where father's class is not available, mother's class is used, which is the practice in the SMI and is here applied to the BHPS. The working class: skilled, semi-skilled and unskilled workers. A two-way class schema is adopted for the respondent's friend's class: service and non-service. Whilst the full-version schema for each of the three friends' class is available in the SMI, only the SOC (standard occupational classification) codes for the 'best friend' are available in the BHPS. This allows service- and non-service- class friends to be distinguished, but not the detailed differentiation among the non-service classes. Given this, the class of the first-mentioned friend in the SMI and that of the 'best friend' in the BHPS are used. It is also to be noted that, in the SMI, such a person is called 'most frequent spare-time associate' rather than 'friend'. To be compatible with the terminology in the BHPS and with the general practice in previous research (Heath, 1981; Mitchell & Critchley, 1985), he/she is called 'friend' in the present paper. Because we are restricted to questions regarding best friends we are unable to explore the social range of weak tie friendships, in the manner highlighted by Erickson (1996) and Lin (2001). We consider the impact of educational qualifications and include this factor in the analysis of friendship construction and civic engagement to see whether it plays a role independent of class. A four-way variable is constructed for educational level: degree or above; professional qualifications below degree (such as teaching or nursing); A/O Levels; vocational or no qualifications. Previous research in friendship construction was either limited to male respondents due to data limitations (Mitchell & Critchley, 1985; Goldthorpe, 1981/82; Heath, 1981) or had male and female respondents combined (Wright, 1997). As a result, little is known about women's friendship and civic engagement patterns and how they are different from men when other socio-cultural factors are taken into consideration. In view of this, we analyse men's and women's friendship and civic participation separately. We use descriptive statistics for disclosing the observed patterns and trends in absolute terms, and logistic regression models for measuring the direction and the strengths of association of variables taken to be of theoretical importance to the outcome variables. We use data from the SMI and the two waves in the BHPS as cross-sectional surveys. For this purpose, we have applied BHPS cross- sectional weights to each wave to obtain population estimates of parameters. We used Stata 7 statistical software with analytical weights in descriptive analysis and probability weights in the modelling procedures. In the following, we shall proceed with an analysis of socio-cultural class formation and of civic participation. As we shall see, friendship construction is not only an important factor in class formation, but also a crucial factor underlying social capital generation. 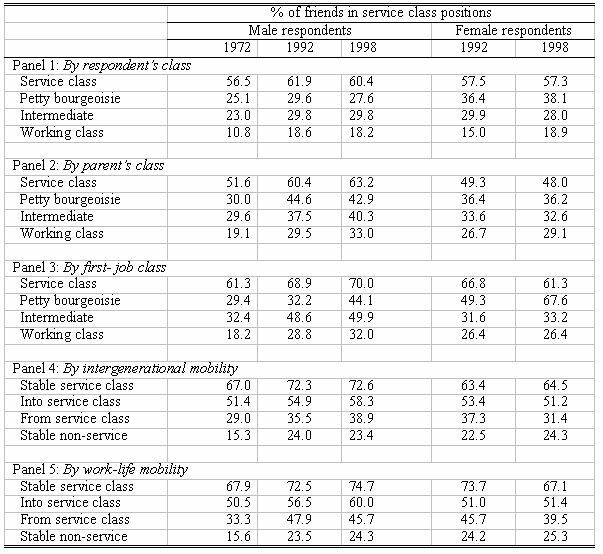 Table 1 shows the proportions of service-class friends by respondent's class, parental class, first-job class, and inter/intragenerational mobility trajectories. 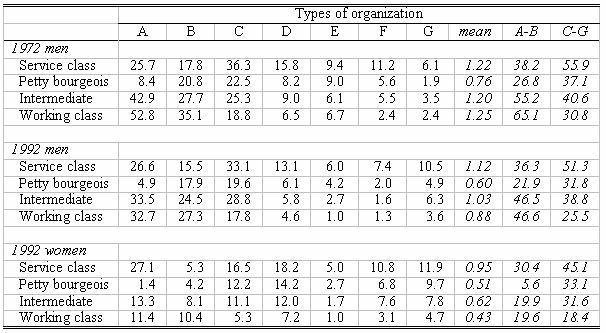 The most prominent feature in all panels of the table is that friendship structure closely mirrors that of the respondents. Looking firstly at the association between respondents' and their friends' class (Panel 1), we see that, from 1972 to 1998 and for both sexes alike, service-class members were consistently and strikingly (about 40 percentage points) more likely than the working class to have friends who are themselves situated in service class positions. As a result of the upgraded social structure, people in all classes had better chances of making service-class friends, but class differentials, especially those between the 'top' and the 'bottom', remained. The patterns and trends suggest that a model of 'constant social fluidity' (Erikson & Goldthorpe, 1992) may be operating in friendship construction, a theme we shall be examining in the next section. However, in terms of the relationship between class formation and friendship, the evidence supports the idea that, as it gets bigger, the service class becomes more distinctive and more consolidated, with increasing endogamy within it. 1	For respondents aged 20-64 at the time of interview and resident in England and Wales, the same below. 2	Weighted data used, the same below. Source: Social Mobility Inquiry (SMI) of 1972, and the British Household Panel Survey (BHPS) of 1992 and 1998 (the same below). The effects of parental class are somewhat weaker than current class, but are still very strong (Panel 2). Across the three decades, men from service-class families are twice as, or about 30 percentage points more, likely to have service-class friends as men from working-class families; and women from service-class families are about 20 points more likely to have service-class friends than women from working-class families. The effects of first-job class are slightly stronger than those of the origin class and are comparable to those of the current class (Panel 3): a gap of about 35-40 percentage points between the service class and the working class, which holds for men and women alike and at each of the time points under consideration. In both respects, the greatest differences were between the service and the working classes. There is likely to be a very complicated process underlying the observed patterns and trends. For instance, much of the social mobility research has shown (Goldthorpe, 1987; Marshall et al., 1988; Savage et al., 1992) that people in advantaged social positions possess superior socio- economic and cultural resources, which are used to transfer class advantages both over generations and in the course of work-life careers. People from service-class families are much more likely to be found in the service class in the first and the present job. We have constructed measures of 'long-range' inter-/intra-generational mobility, i.e. mobility into or from the service class, by combining parental class with respondent's current class, and first-job with current classes, respectively. Panels 4 and 5 in Table 1 show striking effects of inter/intragenerational mobility. With regard to intergenerational mobility (Panel 4), the stable service-class men were around 50 percentage points more likely than the stable non-service-class men to have service-class friends in the three decades; for the female respondents, the effects were somewhat weaker but still remained large, with the former around 40 points more likely than the latter to have service-class friends in both 1992 and 1998. The effects of work-life mobility on friendship construction (Panel 5) were as strong as in intergenerational mobility, for men and women alike, and across the time span. We can also see, for both sexes alike and in both trajectories of inter- and intra- generational mobility, that the upwardly mobile were, across the time points covered, much more (around 20 percentage points) likely to have service-class friends than the downwardly mobile. There is clear and consistent evidence here of strong processes of class 'closure' (Parkin, 1971), which is consistent across time. Having presented data on absolute patterns in the three decades, we now examine relative changes in friendship construction. As noted earlier, we take friends in service-class positions as the outcome variable, and the respondent's socio-cultural and inter/intragenerational mobility experiences as explanatory variables in the logistic regression models (Table 2). The strongest effects are class, followed by educational qualifications, across all three-time points. At each time point, the service-class men were about 10 times as likely as those in the working class to have service - rather than non-service - class friends, holding constant all other variables in the model. Other things being equal, self-employed and intermediate workers were also significantly more likely to have friends in service - rather than non-service - class positions as compared with the reference group. The class differentials, particularly those between the service and the working- classes, are brought into much sharper relief in the models here than in cross-tabulations in Table 1. It also appears that while service-class respondents were consistently and increasingly more likely to have service-class friends over time, the effects for the petty bourgeoisie and the intermediate classes were weakening, which is quite different from the patterns revealed in Table 1. The overall pattern shows a clear class polarisation amongst friendships. 1. O.R. = odds ratio; S.E. = standard errors (in brackets); * p<0.05, ** p<0.01, and *** p<0.001 (the same below in all models). 2. Weighted data used with robust standard errors (the same below in all models). Education has independent, and consistently strong, effects in friendship construction. Holding constant all other variables in the table, consistently over the decades, degree-holders were around 5 times as likely as the reference group to have service class friends rather than non-service class friends. The effect of having professional qualifications was also significant, albeit weakening over time. The effect of having A/O Levels was consistent. In a detailed analysis of mobility experience, Goldthorpe (1987) shows that men with upward mobility experiences did not feel marginalised, as they were able to make friends with people who had similar experiences. Our analysis is consistent with his arguments in the trends though not in specific instances. The intergenerationally upwardly mobile were significantly less likely in 1972 and 1992, and the intergenerationally downwardly mobile significantly more likely, in 1972, to have service-class friends. Those who had experienced downward mobility in work-life trajectories were also more likely to have service-class friends in 1972 and 1992. These could be viewed as 'lingering effects' of the origin class. In 1998, however, we find none of the trajectory effects significant, though a 'formal' test revealed no relative changes in the trajectory effects. Pooling the data together and creating a dummy (time) variable (1972 = 0, 1998 = 1), we conducted an F test for the interaction terms between 'time' and intergenerationally upward/downward mobility, and 'time' and intragenerationally downward mobility with all other variables in the origin models held constant. The results show no significant effects. This suggests that the underlying mechanisms in the male friendship construction were constant across the three decades, with class having the greatest impact, followed by education, which played an independent role over and above class. The results for the female respondents' friendship patterns present a rather similar pattern. Class, again, proves to be the most important factor. Although weaker than in the case of men, the service class women had a ratio of around 6, and even those in self-employment or intermediate positions had over twice the ratio of service- to non-service - class friends as compared to their working-class counterparts. Education plays an important role for women as it does for men, and in similar magnitude. Other things being equal, women with degrees or above were significantly more likely to have service-class friends, with an odds ratio around 4. Even those with professional qualifications double their odds. A comparison between men and women shows both similarities and differences in the friendship patterns. In terms of difference, the class differentials seem larger for men than for women. In the case of men, the odds ratios were in the range of 10: 2: 2: 1 for the four classes; for women, they were around 6: 2.5: 2: 1. Another notable difference is that whereas the effects of professional qualifications were becoming less important in the case of men, the same did not occur in the case of women, perhaps suggesting the effects of a differential uptake of professional education between the sexes over time. Moreover, while the male respondents with A/O Levels were significantly more likely to have service-class friends than the unqualified men, their female counterparts were little different from the baseline group. Finally, with the exception of upward work-life mobility in 1992, the data for women show no significant, and generally small, mobility effects. What we see, then, is evidence of service class formation over the three decades from 1972. Even though patterns of relative mobility remained broadly constant, it is possible to detect increasing consolidation of the service class (as the class was gaining both demographic and socio- cultural identities), but eroded working class formation (the class was clearly losing on the demographic front and in terms of socio-cultural identity as well). If both core components of class formation went in the direction of favouring the 'top' at the expense of the 'bottom', there are clear implications for politics and social cohesion in general. In the next section we consider how these findings may have implications for understanding patterns of civic engagement and hence social capital. In terms of civic engagement, both SMI and BHPS Wave 2 asked a range of questions from which we selected seven with identical wording: whether respondents were members of trade unions, workmen's or social clubs, sports clubs, religious groups, political parties, parent-teacher associations, and tenant's group/neighbourhood watch programmes. These do not represent all the relevant questions asked in this regard in the surveys, nor are they all the questions that could have been asked in this respect (see Warde et al., 2001 for further examination of these issues). Nevertheless, the comparability of this subset of questions two decades apart presents a unique opportunity for examining change. C-G:	Membership in other organizations -- sports clubs, religious group, political party, parent-teacher associations or tenants' groups ('service-class dominated' organizations). Table 3 presents the data on civic engagement. Looking firstly under the column of 'mean', we see that, in 1972, the working class men were, if anything, slightly more likely to participate in civic associations than the service class; but in 1992, the service class, both sexes alike, were much more likely than the working class to have memberships in such organisations. Looking in greater detail at the class differences in each of the seven memberships, we see that, in 1972, the working class men were twice as likely as the service class to be members of a trade union (52.8 versus 25.7 percent) or a working-men's club (35.1 versus 17.8 percent). In 1992, membership rates in trade unions, and to a smaller extent in working-men's clubs, fell sharply for the working class, but no tangible changes occurred for the service class. That said, it is still the case that the working class were more likely to be members in these two organisations than any other class, with the exception that service class women were more likely to be in a trade union than women in other classes. In all other five organisation types - sports club, religious group, political party, parent-teacher association, neighbourhood watch scheme - the service class men and women were, at both time points, more active than any other classes, the working class in particular. We therefore distinguish civic engagement in trade unions and working men's clubs from involvement in other organisations. Involvement in the former (but not the latter) is consistent with patterns of working-class formation. By posing the issue in these terms we part company with Putnam's (2000) views regarding the 'generic' nature of associations. He tends to regard any kind of voluntary association as having broadly similar implications for social capital, whereas we choose to differentiate these two types of membership since we think they have different implications for class formation. A look at the aggregated data, under columns of 'A-B' and 'C-G' also shows that, at least for men, it is the working class, more than the service class, whose engagement in civic associations declined. In 1972, the former had a clear lead in working-class dominated organisations (27 percentage points, or 65 versus 38 percent) which was roughly matched by the latter's lead in service-class dominated organisations (25 points, or 56 versus 31 percent). However, by 1992, the working-class lead in working-class dominated organisations (10 points, or 46.6 versus 36.3 percent) was nowhere near the service-class lead in service-class dominated organisations (26 points, or 51.3 versus 25.5 percent). It is also worth noting that women service-class members were more likely than their working-class counterparts to be engaged in both types of organisation. In order to have a better understanding of the mechanisms that generate the observed outcomes in the two kinds of organisation, logistic regression models were again employed. We use the same explanatory variables as in friendship construction. In addition, we have included friendship (whether or not one has service-class friends) in order to see whether the class of friends has any impact on organisational involvement. We wish to test whether friendship, as part of the class formation process, has a role to play in civic engagement and what implications it might have on social capital. Table 4 shows the results of membership in working class and service class dominated organisations. The most striking feature in the former regard is that, neither education nor work-life mobility had any effect in 1972 and 1992, but class, intergenerational mobility and, to a certain extent, friend's class, had noticeable effects. For trade union and workmen's clubs in 1972, the ratio of participation to non-participation of men in service class and petty bourgeois positions was only one fifth that of the manual workers, and even the intermediate classes had a ratio of only two thirds. Family origins were still affecting people's participation, especially that of the upwardly mobile, who had a ratio of almost twice as high as the stable working class reference group. Other things being equal, having service-class friends also significantly lowered participation. In 1992, the effects of class, intergenerational mobility and friendship were all weakened to varying degrees, with the intermediate class being no different from the working class in their participation in this kind of activities. The data suggest a loosening class character with regard to engagement in the working-class dominated organisations between 1972 and 1992. To assess whether the service-class's apparently increased involvement was due to chance, we pooled the data together and used 'time' as a covariate (1972 = 0; 1992 = 1) within an interaction for 'time' and class. The data are presented under the heading of '1992 v 1972'. The results show that, as compared with 1972, there was a marked overall drop in trade union/workmen's clubs, but there was also a significant increase in the service- and the intermediate- classes' participation. The odds ratio for the service versus the working class participation increased by a factor of 2.29, and the ratio for the intermediate versus the working class also increased significantly, by a factor of 1.47. Further analysis shows that the relative participation by the service class did not experience any significant decline from 1972 to 1992 whereas that of the intermediate class did fall significantly. This suggests that the changing profile of engagement in this kind of organizations was not entirely due to changes in the social structure and that the traditionally working-class arena of social capital was being rapidly 'gentrified' by the service class. Turning to memberships in service-class dominated organisations, what is immediately notable is that overall membership declined and that there was no significant interaction between class and time, implying an across-the-board decline. The service-class' increase in odds from 1.99 in 1972 to 2.43 in 1999 did not constitute any significant rising membership. Both the self-employed and intermediate classes changed from being significantly more likely than the working class to be engaged in this kind of organisation in 1972 to being no different in 1992. Another important feature is that, in sharp contrast to membership in working-class dominated organisations where education manifested no independent role, here it plays a very important, and increasingly prominent, role in service-class dominated organisations. Having controlled for class and education, inter/intragenerational mobility experiences had no noticeable effect at either time point. Having service-class friends shows a highly significant effect in both data sets. Finally, even though no significant changes were observed in the class character associated with engagement in service-class dominated membership across the two decades when the other factors are held constant, the very fact that the working-class' participation sharply dropped while the effects of the other, particularly service-class' participation remained unchanged, strongly suggests a steadily increasing service class profile in these associations over time. 1: SV = the service class, PB = the petty bourgeoisie, INT = the intermediate class; Degree = degree or above, Prf = professional qualifications below degree, A/O = A/O Levels. Finally in this section, we look at women's participation in the two kinds of organisations (Table 5). We noticed earlier that women service-class members were prominently active in working-class dominated organisations, trade unions in particular. However, the results of the logistic regression show that class positions per se do not account for such prominence. Apart from the numerically small group of petty-bourgeois workers who were significantly less likely than working-class women to participate in such organisations, neither service, nor intermediate, class members were significantly different from the working class. As in the case of men, intergenerational mobility played a significant role with the respondents who had experienced long-range downward mobility tending to be as much inactive as those who had experienced long-range upward mobility were active. Neither work-life mobility nor having service-class friends showed any difference net of education and intergenerational mobility effects. The most important feature is, as shown in the table, the role of education. Other things being equal, women with degrees had an odds 4 times that of their least educated counterparts in similar class positions. In order to have a firmer grasp as to why class and education played such different roles for men and women in working-class dominated organisations, we tested an interaction model by pooling the data together and creating a dummy (male = 0 and female = 1). The results, with all other variables held constant, show that while working-class women were only about one fourth as likely to have membership in such associations as their male counterparts, it is education, particularly university education, rather than class, that explains the gender difference. Whereas education for men did not have salient effects, women with degrees were prominently active (with an odds of 3.76 which is significant at 0.001 level, as shown under the columns 'Women v men' in the table). Women's engagement in service-class dominated memberships showed a remarkably different profile to their involvement in working-class dominated memberships, one rather similar to that of men. Class turns out to be the most important factor, followed by education and friendship. The 'lingering effects' previously noted were also operative here. Those in the service class had odds of 4 times, and those with degrees about twice, that of the least educated working class. As in the case of men, friend's class contributes to the participation. Further analysis, presented in the right-most columns of the table, shows that women's participation was not different from men in this kind of association. We have analysed the patterns and trends in friendship construction and civic engagement for men and women in British society across the three decades. We now spell out our findings regarding the relationship between class formation, friendship patterns and civic involvement. In order to facilitate the analysis, we shall combine the petty bourgeois with the routine non-manual, manual supervisorial and lower technical into the intermediate group and use a nine-way group obtained from the 'parent by son' table cells for mobility affiliations. This will permit analysis of the patterns and trends in friendship construction and engagement in the two kinds of civic associations previously used. As our interest here is not in the relative fluidity of the class structure, absolute changes in the patterns are more appropriate for an analysis in class formation and class affiliations. Data in Table 6 show the patterns and trends where prominent features are highlighted. The first thing to notice is, as seen under the columns of 'proportions found in mobility groups', that the stable working class group decreased in size by a large margin (12.9 percentage points) between the two decades. The decline was absorbed in the other, notably the stable service-class, groupings (increased by 6.5 points). The columns under 'having service-class friends' show that, in 1992, all groupings were more likely to have service-class friends thanks to the increased proportions of friends in service-class positions. But the class differentials remained at an astonishing level: 67.0 percent of the stable service class had service-class friends in 1972, which became 72.3 percent in 1992; the corresponding figures for the stable working class were only 9.3 and 16.9 percent respectively. Another notable feature in this regard is the very strong effect of mobility experiences: the intergenerationally upwardly mobile men were as markedly more, as the downwardly mobile men were less, likely to have service class friends. With regard to civic engagement in working-class dominated organisations (trade union or working-men's clubs), one finds an interesting feature when comparing the patterns in 1972 and 1992. In the early 1970s, around two thirds of working-class men, whether intergenerationally stable or downwardly mobile, were engaged in either trade union or working-men's clubs, whereas only slightly over one fourth of the intergenerationally stable service class men were so found. Two decades later, whereas participation in all other groupings declined to varying degrees, that by the intergenerationally stable service class actually increased. As a result, the class gradient was sharply reduced, from 40 percentage points between the two ends of the class spectrum in 1972 to only 18.6 point twenty years later. In other words, while the 'enthusiasm' of all other groups receded to varying extent, that of the most advantaged group stood unchanged. Looking, lastly, at the engagement in service-class dominated organisations, one finds that the most advantaged group was about 30 percentage points more likely than the least advantaged group to participate in this type of organisations at both time points, even though this kind of engagement had, on the whole, decreased. Let us now take stock of our arguments. Goldthorpe (1987) argued that the working class was demographically better formed than the service class, at least in the early 1970s. Many members of the working class had fathers who were working class, and were therefore well socialised into its culture and lifestyle. By contrast, the service class, by virtue of the extent of upward mobility into it, was not as demographically cohesive (see, also, Erikson & Goldthorpe, 1992). Savage (2000) suggests that Goldthorpe's emphasis on the socio- cultural identity of the working class is over-stated. In part, he disputes Goldthorpe's contention that the working class is demographically cohesive by noting that the exclusion of women from his analysis (many of whom are located in working class positions) means he cannot draw inferences about the nature of working class formation from a male sample survey. More generally, Savage goes on to argue that social trends are leading to the social de-composition of the working class. We can see from our analysis that this argument is in general confirmed by considering the nature of friendship and civic involvement (though the lack of data on working-class friends means that we cannot fully explore the working-class formation in the 1990s). We should preface our comments by noting that Table 2 and Table 4 show there was little change in the relative odds of any of our independent variables in predicting whether one has a service class friend, or whether one is in a service or working class association. To this extent, there appear no trends towards either a reduction, or an accentuation of class inequalities, in relative terms. However, we are concerned with the absolute changes, and here there are significant developments. Considering the issue of demographic class formation, there is evidence of working-class de-composition and service-class consolidation since the time of Goldthorpe's study. This argument is reinforced when friendship construction and civic engagement is included in the analysis. We have seen that friendship construction, as an essential ingredient in the processes of class formation, also served to consolidate the service-class and undermine working-class formation. Over the period as a whole there were tremendous class differences in the friendship structure, with service-class members much more likely to have service class friends. Even though no relative changes were discerned either over time or between the sexes, the net outcome of such class differentiation was a rapid contraction of the core non-service-class affiliations and a notable expansion of the service-class affiliations, at least for men. That the stable service class men were more likely to report having service-class friends and both intermediate - and working - class men were more likely to have friends from the service class suggests that whilst the class homogeneity of friends was increased for the service class, it was reduced for the other classes. Turning to participation in civic life, we see a significant decline in the realm of what we have called 'working class dominated organisations'. These organisations declined in size, but more importantly, they became less distinctly working class in their membership. The service class, especially the intergenerationally stable sections of it, showed no change in participation in either absolute or relative terms. Mobility effects were evident in the earlier period, but became subsumed in class and educational effects by the later period. The picture for service-class dominated organisations is very different. Those in the most advantaged class positions were becoming increasingly distinctive as core elements in membership of these groups, for both sexes alike, holding constant education and friendship patterns. Whilst educational qualifications per se played no visible role except those mediated via class for men in their decision to participate in trade unions or workmen's clubs, a very different picture was obtained in the case of women, where education rather than class was the key. In a society where women are increasingly improving educational credentials, they may be becoming an important source of recruitment for political activism. The picture in general, therefore, is consistent across all the dimensions we have analysed. In every regard, we see a weakening of working class formation and a strengthening of service class formation. Finally, turning to consider the implications of our analysis for understanding social capital, we can firstly note that whilst social capital at an aggregate level in the UK has not declined, there have been some very important shifts in its distribution, which are not only the product of occupational shifts. The service class plays an increasingly important role in 'staffing' civic associations, and also is more prominent in formerly working class organizations. Against the 'trickle down' view that all members of society can share in the social capital nurtured by the service class, we suggest that a historical contest between different forms of social capital has over the past three decades been concluded in favour of the service class (see generally, Savage, 2000). Working class men were historically able to sustain their own kinds of social capital through distinct forms of sociability and civic engagement (especially through trade unions, working men's clubs, etc.). Social trends over the past thirty years have radically weakened these forms of engagement, and have led to the hegemony of forms of social involvement that have traditionally been associated with the middle class. Unsurprisingly, the service class retain, and indeed may enhance, their relative advantages in populating these arenas of social capital, which become increasingly inaccessible to the working class. This is consistent with Bourdieu's emphasis on the way that the 'political field' (defined here crudely as the public realm) is exclusively middle class and does not allow in those without access to cultural capital. Consistent with this interpretation, working class respondents are disproportionately less likely to be in civic organisations in the 1990s than they were in the 1970s. This account, we would speculate, can explain why personal trust is falling, even though associational memberships are stable, since the vitality of associational life can be taken as an indication of the lack of generalized social trust. If this pessimistic picture is true, then it suggests that the relative persistence of social capital in the UK has worrying implications. It also suggests that, theoretically, it is not enough to assess the changing 'stock' of social capital at an aggregate or general level. It is vital to pose the issue of 'whose' social capital is changing. 1 Putnam's (1993) work on Italy focuses more on voluntary association, whilst his account of social capital in America is more attentive to the possible social capital derived from informal networks. Nonetheless, it remains clear that he attaches particular significance to involvement in formal associations. 2 For a critical evaluation of the thesis of declining social capital proposed by Putnam and the thesis of no decline proffered by Hall, see Li, Savage and Pickles (2003). 3 The BHPS data used in this paper were originally collected by the ESRC Research Centre on Micro-social Change at the University of Essex (now incorporated within the Institute for Social and Economic Research). Neither the original collectors of the data nor the Archive bear any responsibility for the analyses or interpretations presented here. 4 We are grateful to Professor Anthony Heath for suggestions over the algorithms used in constructing the educational variable in the SMI. 5 We could use 'parent class' and 'first-job class' as main-effects variables and then add interaction terms between respondent's current class and parent class, and between respondent's current class and first-job class. The results would be similar but the presentation much less straightforward. Strictly speaking, we ought to refer to classes as the inter-/intra- generationally stable service class, the inter-/intra-generationally stable petty bourgeoisie, and the inter-/intra-generationall stable working class each time we discuss the main class effects. However, for the ease of expression, we simply refer to them as the service class, the petty bourgeoisie and the intermediate class. 7 Further analysis shows, however, that there is no relative change in the propensity of the different classes in friendship construction. Holding constant all other variables in the model, the interaction model for 'time (1998 = 1, 1972 = 0) by class' has p values 0.44, 0.32 and 0.53 for the service-, petty bourgeois and intermediate classes and the F test results in chi2(3) = 1.13 and p = 0.77. 8 Holding constant all other variables in the model, the F test for the effect of the interaction terms for 'time*intergenerationally mobile into service class', 'time*intergenerationally mobile from service class' and 'time*worklife mobile from service class' results in chi2(3) = 0.28 and p = 0.96. 9 Further analysis, holding constant all other variables in the model, shows no relative change, between 1992 and 1998, in the propensity of different classes for women in friendship construction, the p values being 0.26, 0.72 and 0.21 respectively; nor any decline in the effects of educational qualifications, with p values being 0.26, 0.46 and 0.30 respectively. 10 As in the case of men, there was a very strong association between education and class. While only 8% of the women with the lowest educational qualifications were found in the service class in 1992 and 1998, nearly 80% of the degree holders were so found at both time points. Again similar to the case of men, there is no interaction effects between education and class once their main effects are controlled for. 11 Other scholars have made efforts in a similar direction. For instance, Hall says that 'the working class draws its organizational affiliations disproportionately from trade unions and workingmen's clubs' (1999, p.456). 12 The test for the service-class participation in 1992 and 1972 yields a chi-square value of 0.09 at one degree of freedom, at the 0.77 level. On the other hand, the test for the participation of the intermediate class has a chi-square value of 9.98 at one degree of freedom, at the 0.002 level. 13 A test for the interaction model for 'time (1992 = 1, 1972 = 0) by education' while controlling for all other variables in the model shows a significant change in the role of education in this regard. The odds ratios for degree, professional and A/O Levels were all around 1.5, and the p values for the latter two categories were significant at 0.05% and 0.01% levels. 14 The interaction term for the 'time and class' has p values of 0.17, 0.60 and 0.90 for service-, petty bourgeois-, and intermediate- classes respectively. 15 The F test for the 'female and class' and 'female and education' interaction model has chi2(6) = 38.72 and p = 0.00. 16 One main area for debate which we do not discuss here are Savage et al. 's (1992) arguments that Goldthorpe does not fully recognise the extent of intra-service class differentiation (see also Butler and Savage 1995; Li 1997, 2002). To address this issue it would be necessary to decompose the service class into professional and managerial wings which we will carry out in future analysis. Much can be gleaned on these issues in Li, 1997. 17 For the effects of social mobility, friendship construction and civic engagement on people's political preferences, see Savage and Li 2003. For the effects of social mobility on political preferences, see Clifford and Heath 1993; De Draaf, Nieuwbeerta and Heath 1995. ADAMS, R. and GRAHAM A. (editors) (1999) Placing Friendship in Context. Cambridge: Cambridge University Press. BLACKBURN, R.M. and PRANDY, K. (1997) 'The Reproduction of Social Inequality', Sociology, Vol. 31, pp. 491-507. BOURDIEU, P. (1986) 'The Forms of Capital', in J. Westport (editor) Handbook of Theory and Research for the Sociology of Education. New York: Greenwood. BOURDIEU, P. (1987) 'What Makes a Social Class? On the Theoretical and Practical Existence of Groups', Berkeley Journal of Sociology, Vol. 32, pp. 1-17. BRITISH HOUSEHOLD PANEL SURVEY [computer file] (2001) Principal investigator, ESRC Research Centre on Micro-social Change. Colchester: The Data Archive [distributor]. Data files and associated documentation. BUTLER, T. and SAVAGE, M. (editors) (1995) Social Change and the Middle Classes. London: UCL Press. CLIFFORD, P. and HEATH, A. (1993) 'The Political Consequences of Social Mobility', Journal of the Royal Statistical Society,Series A (Statistics in Society) Vol. 156, pp. 51-61. DE GRAAF, N., NIEUWBEERTA, P. and HEATH, A. (1995) 'Class Mobility and Political Preferences: Individual and Contextual Effects', American Journal of Sociology, Vol. 100, pp. 997-1027. ERICKSON, B. H. (1996) 'Culture, Class, and Connections', American Journal of Sociology,Vol. 102, pp. 217-251. ERIKSON, R. and GOLDTHORPE, J.H. (1992) The Constant Flux.Oxford: Clarendon Press. FRANK, K. A., and YASUMOTO, J. Y. (1998) 'Linking Action to Social Structure Within a System: Social Capital Between and Within Subgroups', American Journal of Sociology,Vol. 104, pp. 642-686. GIDDENS, A. (1971) Capitalism and Modern Social Theory.Cambridge: Cambridge University Press. GOLDTHORPE, J.H. (1981/82) 'Social Standing, Class and Status', Social and Community Planning Research, Survey Methods Newsletter, pp. 8-11. GOLDTHORPE, J.H (1982) 'On the Service Class, its Formation and Future', in A. Giddens and G. Mackenzie (editors) Social Class and the Division of Labour: Essays in Honour of Ilya Neustadt. Cambridge: Cambridge University Press. GOLDTHORPE, J.H, with LLEWELLYN, C. and PAYNE, C. (1987) Social Mobility and Class Structure in Modern Britain.Oxford: Clarendon Press. HALL,P. A. (1999) 'Social Capital in Britain', British Journal of Political Social Science,Vol. 29, pp. 417-461. HEATH,A. F. (1981) Social Mobility.London: Fontana. JAMIESON,L. (1998) Intimacy: Personal Relationships in Modern Societies.Cambridge: Polity. LI, Y. (1997) The Service Class: Theoretical Debate and Sociological Value. D. Phil Thesis: Nuffield College, Oxford University. LI, Y. (2002) 'Falling off the Ladder? Professional and Managerial Careers', European Sociological Review,Vol. 18, pp. 253- 270. LI, Y., SAVAGE, M., TAMPUBOLON, G., WARDE, A. and TOMLINSON, M. (2002) 'Dynamics of Social Capital: Trends and Turnover in Associational Membership in England and Wales: 1972-1999', Sociological Research Online, Vol. 7, No. 3. LI, Y., SAVAGE, M., and PICKLES, A. (2003) 'Social Capital and Social Exclusion in England and Wales (1972-1999)', Mimeo: University of Manchester. LIN, N. (2001) Social Capital. Cambridge: Cambridge University Press. MARSHALL, G., ROSE, D. NEWBY, H. and VOGLER, C. (1988) Social Class in Modern Britain. London: Hutchinson. MARSHALL, G., SWIFT, A. and ROBERTS, R. (1997) Against the Odds? Social Class and Social Justice in Industrial Societies. Oxford: Clarendon Press. MITCHELL, C.J. and CRITCHLEY, F. (1985) 'Configurational Similarity in Three Class Contexts in British Society', Sociology, Vol. 19, pp. 72-92. PAHL,R. (2000) On Friendship. Cambridge: Polity. PARKIN,F. (1971) Class Inequality and Political Order.London: McGibbon & Kee. PAXTON,P. (1999) 'Is Social Capital Declining in the United States? A Multiple Indicator Assessment', American Journal of Sociology,Vol. 105, pp. 88-127. PUTNAM,R. (1993) Making Democracy Work: Civic Traditions in Modern Italy. Princeton, N.J.: Princeton University Press. PUTNAM, R. (1996) 'The Strange Disappearance of Civic America', American Prospect,Vol. 24, pp. 34-48. PUTNAM, R. (2000) Bowling Alone: the Collapse and Revival of American Community.New York: Simon & Schuster. SAVAGE, M. and LI, Y. (2003) 'Social Capital and Political Partisanship in England, 1972-1999', Mimeo, University of Manchester. SAVAGE, M. (2000) Class Analysis and Social Transformation.Milton Keynes: Open University Press. SAVAGE, M., BARLOW, J., DICKENS. P. and FIELDING, T. (1992) Property, Bureaucracy and Culture: Middle-class Formation in Contemporary Britain. London: Routledge. STEWART, A., PRANDY, K. and BLACKBURN, R. (1980) Social Stratification and Occupations. London: Macmillan. WARDE, A., TAMPUBOLON, G., TOMLINSON, M., RAY, K., LONGHURST, B. and SAVAGE, M (2001) 'Tendencies of Social Capital: Dynamics of Associational Membership', Paper delivered to the BSA Annual Conference, Manchester, April. WRIGHT,E. O. (1978) Class, Crisis and the State.London: New Left Books. WRIGHT, E. O. (1997) Class Counts. Cambridge: Cambridge University Press.